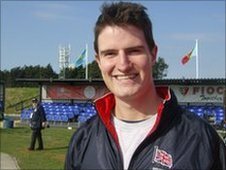 Dorset marksman Peter Wilson has earned Britain an Olympic quota place in the men's double trap shooting event by winning World Cup silver in Chile. Wilson moved up from sixth to second in the final round of shooting, while Russia's Vitaly Fokeev shot a world record to take gold. "This puts me in line for the Olympics and there's nothing comparable, it's the high point," Wilson told BBC Sport. "I've never been in this position before. It's a bit mind-blowing." British shooters have been handed automatic entry to nine of the 15 Olympic shooting events as the host nation. But the team must earn the right to compete in the remaining six disciplines, of which one is the men's double trap - won by Britain's Richard Faulds at the Sydney 2000 Games. Wilson is the first member of the GB squad to earn a quota place in any of those six disciplines but, importantly, the place is assigned to the British team as a whole and not Wilson as an individual. This means that while Wilson earned the place, British Shooting may nominate another competitor to take up the place at the Games - though this is unlikely. "It's the governing body's place but, in the past, if you're quite capable of winning on the international circuit then generally speaking you tend to get sent," explained Wilson. "It doesn't mean I'll definitely be going but I've got my foot in the door. I have to perform at a high level for the next year and a half." 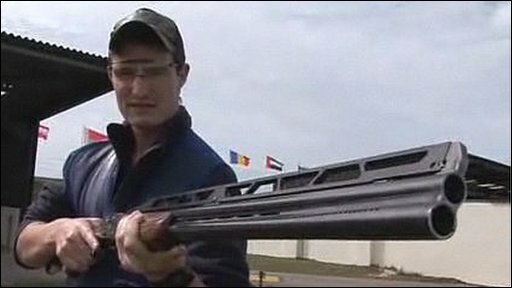 There are several remaining opportunities to earn qualification places in the run-up to the Games, including the 2011 shotgun World Championships, to be held in Serbia in August.